Perhaps one of the biggest reoccurring blind spots we Christians deal with is the certainty we have about the part of God that we do understand. We sometimes insist on forcing the Scriptures to fit the worldview given to us by our “first” teachers. We end up reading what we believe instead of believing what we read in the Bible. In my book “Roadkill Seminary” I state that we ironically have to be delivered from our commitment to our brand of the Christian religion in order to more fully discover the person of Jesus Christ. This realization often only comes through prolonged and difficult trials of the soul. In my book “Working Together For Jesus” I have a chapter called “Anointed Self-Deception” where I detail this blindness to see things as they really are. Several biblical characters were infected with this short-sightedness. They were so sure the part they had from God was “THE” part that they ended up in “anointed self-deception”. The obvious ones were Elijah in 1 Kings 19:18; Peter in Matthew 17:4; and John in the book of Revelation 19:10 and 22:9. These all made incorrect statements and assumptions in the midst of awesome anointed events as they were serving the Lord. Let’s look at some of the common areas where we get hung up. Eschatology – Preterists, Amillennialists, Futurists and Dispensationalists work very hard to fit their view of the End-times into a systematic grid, but fair-minded observers note they can’t fit everything they believe into an error free narrative. I’m sorry if I am popping your theological bubble here but each point of view has to fill in certain passages of scripture with speculation, conjecture and hypothesis. Of course they are fine with doing that but they often won’t allow the other guys the same latitude with their narrative. See “Who’s Right About The End Times”. Law and Grace – Perhaps nothing has Christians arguing more today than how we should decide the correct application of God’s Law -judgment and His Grace-mercy. In my book “The Inner Journey” I attempt to remind us all of the Biblical illustration the Lord gives us in His Tabernacle. His Law is written in stone so no theologian can erase His holy standard; yet He keeps the stone tablets in a box covered with His own blood so no theologian can suggest any of us are unredeemable. I still see both Law and Grace alive and active in our day. Its in these in-between places where God speaks with us about everything. Sadly the old adage; “the devil is in the details” may never be more true than here. My article “In the Year 2023” may help the discussion between those who emphasize Law and those who emphasize Grace. Politics – Conservatives and Liberals approach to the Scriptures from the opposite emphasis of righteousness and justice, see Psalm 89:14. One focuses on our vertical relationship with God and His righteousness, the other focuses on our horizontal relationship within society and His justice. In my book “A Better Way To Govern” I discuss how seeing the bigger picture here gives us the grace to overcome the caustic rhetoric that eats away at the solutions we all so desperately need. This doesn’t help television or talk radio ratings but it will change our world for the better. The News – The George Zimmerman and Trayvon Martin story that we here in Sanford were so involved with presents another illustration. Some of my liberal friends post only the articles that make George Zimmerman look like an untrustworthy racist and some of my conservative friends will only post articles that make Trayvon Martin look like a no good thug. They each seem incapable or unwilling to acknowledge the other point of view. Are we capable of a better way? My articles on “Choosing Between Jesus or Barabbas” helps us recognize what spirit we are operating in when trying to address entrenched problems in our communities. I’m not faulting anybody with a belief system they support. They are doing the best they know how from their point of view. However we forget that a point of view is just that, a view from a point. I do think we need to aware that when we are hell-bent on making things fit our point of view we can contort the heart of the Scriptures to make them fit our presuppositions. Some of us do so much Scripture twisting we make an Olympic Gymnast look arthritic. In the end I keep noticing that each point of view falls short if left in isolation to the others. I like Psalm 119:160 where it says; the sum or the entirety of Your Word is truth. It’s when all the pieces are considered together, do we begin to see the big picture more accurately. Its not your way or my way, its Yahweh Who needs to be our focus. 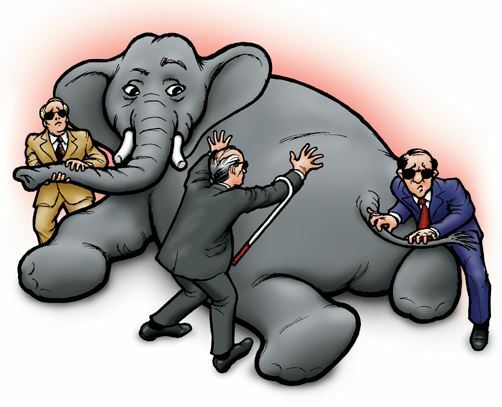 I think many of us have heard some version of the story of the blind men and the elephant. One was holding his tail and described it as a rope. The other held its trunk and described it as a tree. The other held its ear said it was like a leaf. They were all partly right but totally wrong. Sometimes we do the same describing God. Our initial observations are correct but our conclusions often misrepresent the bigness of God and His purposes. When people ask me what theological camp I embrace, I tell them I embrace a belief system that I call “Big Theology”. B – God is Big – This should go without saying but as we try to define God or a particular aspect of God we may inadvertently make God small. In an effort to be exact, we can become myopic. We exchange the micro for the macro. We miss the forest because of the trees. We end up making God smaller and easier to handle for our convenience. We forget He exists and works from several extra-dimensions and to make Him fit into our worldview is like explaining the internet to the ants in your back yard. A little perspective here may be just the dose of humility we all need. I – God is Inviting – The apparent Biblical contradictions (called the principle of antinomy) between doctrines and groups within the Body of Christ are put there by divine providence. Dr Stephen Crosby points out in “Authority, Accountability and the Apostolic Movement” that it is the very polar opposite positions we spoke of earlier that creates a magnetic field that draws objects into its space. They make us look into the mystery. Neither the Scriptural contradictions nor the skeptics should discourage us from pressing in. The dichotomies and contradictions in Scripture and in our society should draw us in to find where God is in the mix. There should be a magnetic attraction moving our hearts to look deeper into the mystery before us. Jesus didn’t speak parables and mysteries to keep truth “from” us but to keep truth “for” us. It is only those who have a royal seekers heart that are deemed worthy of receiving these precious kingdom truths in the first place. G – God is Glorious – If we study the Scriptures with an open and humble heart the fruit will be wonderment and amazement. God is like the ocean; you can play in the water ankle-deep but if you are willing to relinquish control you can go deep! When we see Emmanuel in the manual we are swept away in awe and beauty. The glorious revelation of Him causes us to worship. That is why Jesus said we worship God in Spirit and in Truth. Theology is the child of worship. Revelation of Him should transform us into His image, not into the image of our particular denomination outlet or network. God is dynamic. He never changes but He is always moving. Beware of religious rigor mortis. That which is static is often dead. He is not the scaffolding used to build the building. He is more than our doctrines and opinions. He is not the wrapping paper or the box the gift comes in. He is so much more than that. He is “BIG”. Posted in Most Popular Articles and tagged Big Theology, Christian Maturity, Eschatology, Frank Viola, Freewill, Jeff Krall, Righteousness and Justice, Roadkill Seminary, Trayvon Martin, Working Together For Jesus on July 26, 2014 by Jeff Krall.